Ready for the 14th Ginger event everyone? Save the date for one of Boston’s largest food events of the year! A Taste of Ginger will feature thirty of Boston’s most celebrated chefs including Jasper White of Summer Shack, Andy Husbands of the Smoke Shop, and Tracy Chang of Pagu. See below for the list of all participating restaurants - see you at the Museum of Fine Arts, Boston!! This Sunday, brunch in Kendall Square! 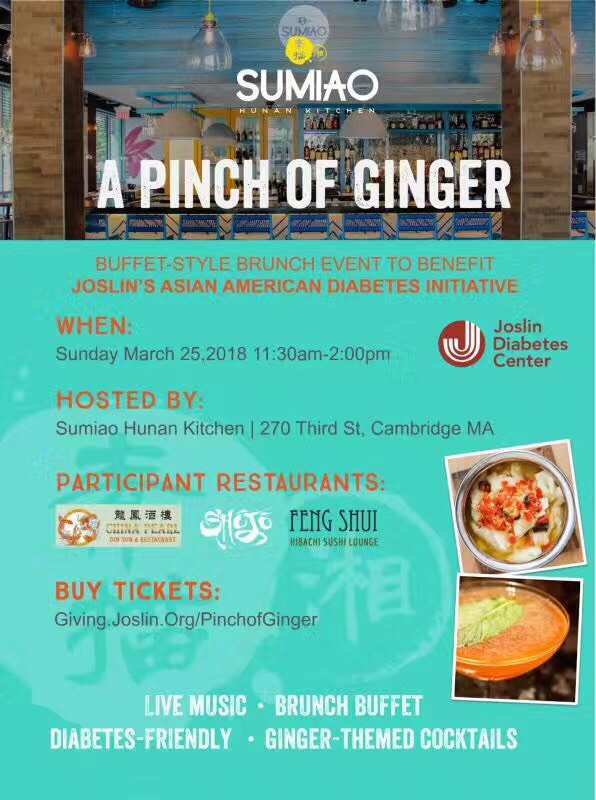 Sumiao Hunan Kitchen, one of our "A Taste of Ginger" restaurant participants, is hosting a brunch event called "A Pinch of Ginger" on Sunday, March 25 at their restaurant in Kendall Square, Cambridge, MA. Restaurateur Brian Moy and Dr. George King on Urban Update! Restaurateur Brian Moy of BLR by Shojo Shōjō Ruckus Boston and China Pearl Restaurant - Boston and Dr. George King appeared on Urban Updates on 7News - WHDH again and took us through all the details for this year's A Taste of Ginger! Check out more chefs sharing their passion for Ginger! WHAT: Kendall Square’s Sumiao Hunan Kitchen is continuing its tradition of bringing imbibers a new monthly cocktail special available all month as created by their team of mixologists. Available throughout the month of February, the Not Your Grandma’s Apple Pie transforms everyone’s favorite childhood dessert into a dangerously delicious grownup treat combining smooth whiskey with a house-made apple cider reduction, muddled lemon zest, a splash of ginger liqueur and two dashes of aromatic bitters shaken and stirred over an open-edge tumbler($8). Balancing sweet, citrus, smokey, zesty and delicate toasted ginger honey flavors, SHK’s Not Your Grandma’s Apple Pie delivers some of that classic taste you love while adding the kick you need at the end of a long, winter’s day. Think of it as dessert in a glass… with a buzz. WHEN: Available during normal operating hours throughout the month of February. Opened in July of 2017, Sumiao Hunan Kitchen is first Hunanese concept in Greater Boston. Located in the bustling and tech-driven Kendall Square, Sumiao Hunan Kitchen is the loving creation of Sumiao Chen – a passionate female restaurateur and scientist from Xiangtan, Hunan, China – and a team of restaurant industry veterans and investors. Sumiao, whose name in Chinese means “sketch,” stays true to her namesake by creatively melding tradition with modernity to bring forth an unmatched dining and social experience. Sumiao Hunan Kitchen aims to shatter preconceived notions that Chinese food is a low-cost, low-quality experience by introducing an authentic, contemporary Asian concept that is largely unknown in the local area. For more information, please call (617) 945-0907 or visit www.sumiaohunan.com. Follow Sumiao Hunan Kitchen on Facebook, Instagram and Twitter at @SumiaoHunan. WHAT: In celebration of World Baijiu Day, Kendall Square’s newly opened Sumiao Hunan Kitchen will be shaking up specialty cocktails using the world’s most consumed spirt. Baijiu, a Chinese grain spirit known as shaojiu or sorghum wine that is rarely seen in these parts, will take centerstage at Boston’s first Hunanese restaurant on August 9 as their team serves up playful interpretations of traditional drink. In addition to popping baijiu by the bottle including Maotai ($288), Wuliangye ($188) and Luhzou Laojiao ($118), the team at Sumiao also will offer tastings of baijiu in one-ounce pours from the Hong Kong ($11) and Jiannanchun ($16) varietals. Beverage consultant Richard Echeverria has created a collection of baijiu-laced libations ($14 each) that give Bostonians a taste of Chinese culture including the Schrodinger’s Coupe with Hong Kong, curaco, grapefruit, lime and plum bitters; Ice Cold Fusion with Mianzhu Daqu, cognac, triple sec and lemon; Perpetual Motion with Mianzhu Daqu, blood orange, lime, elderflower liqueur and mint; and, Pyroclastic Punch with Hong Kong, Fruitlab hibiscus liqueur, passionfruit cordial and lemon. MORE INFO: Baijiu cocktails and bottles are available at a la carte pricing.